One disadvantage of the DFC (Direct Flight Control) Rotor Head is that it puts the blade grip control links under a lot of strain and they eventually can fail causing a crash. Align tried to solve the issue by changing the design of these links and supposedly making them stronger . The new links are called "Main Rotor Grip Arm Integrated Control Links". These new links are made from solid aluminum and there is a pair of ball bearings at the pivot point where the link is attached to the blade grip. The blade control links transfer the axial movement of the swashplate (when the servos move it up/down to change blade pitch angle or tilt it for aileron / elevator control) up to the blade grips while transferring down the rotational force of the blade grips to the top (rotational) part of the swashplate. The main issue with this design as part of a DFC rotor head is that it relies on a very stiff head dampening in order to minimize the axial movement of the feathering shaft. 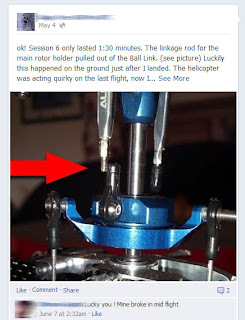 Any significant movement of the feathering shaft puts serious strain on the linkage, trying to "pry" it off the swashplate's linkage ball due to the created lateral force on the link arm. By coming up with the metal "integrated arm" design, Align attempts to reinforce the linkage strength but they have focused on the top portion of the linkage. By keeping the standard for the 450 series plastic link ends on the arm, what they did is just to move the failure point down - a chain is as strong as its weakest link. DFC pilots often see control link failures in that area, especially when flying 3D - the plastic ends sometimes break off or are being pulled off the link arm. Point and case is this facebook post. It is a shame when failure of a $1 plastic part causes the destruction of a few hundred dollar heli due to poor design. To improve on the reliability of these links, what I did is to replace the lower portion of the Integrated Control Link Arm with a beefier hardware designed for Align T-Rex 550. The part number needed for this mod is "Align T-Rex 550 Stainless Steel Linkage Rod A - HN6065A"
This my 450 PRO FBL DFC rotor head with the modified Blade Grip Control Links already fitted on. I used a 2 mm drill bit to carefully enlarge the threaded hole on the bottom of each Integrated Arm link. The 550's Stainless steel Linkage Rod A has a slightly larger diameter - 2 mm (actual 2.2mm) vs. 1.6 mm on the original rod. I didn't use the motor of my electric drill - I just placed the drill bit in the chuck and rotate it manually, very slowly, while making sure I drill straight along the axis, until the bit bottoms out. There was very little material that was actually removed. To thread the new 550 linkage rods that came with the kit, I had to cut a new thread in the aluminum arm. The main problem is that the steel Linkage rod A has a square thread (it is designed to normally go into plastic link ends on both sides), not the regular screw type of thread, so using a standard 2 mm tap is of very little help (it did next to nothing). What I ended up doing is to use one of the extra linkage rods from the kit as a tap by holding it firmly with pliers and working it in - rocking it back and forth. The rods are made from much harder stainless steel and the arm is soft aluminum so it is not that difficult to make the new thread. Because I had to hold the rod for one of the threaded portions with my pliers I just marked it for future use as "tap" and didn't use it for actual linkage. I took a new linkage rod, applied some RED (high-strength) thread locker and threaded the rod inside the arm until it bottomed out. All of the threaded portion of the rod should sink in. It is very important to clean all metal shavings and debris from the hole beforehand. If the rod is too loose because of sloppy drilling - CA glue or even better JB Weld metal epoxy can be used instead of thread locker to permanently fix the rod - the link arm side of the rod does not need to be adjusted so permanent fix is actually a better solution. After a few hours for the thread lock to cure, I just screwed onto the rod ends the heavy duty 550 plastic link ends that came in the package - they have exactly the same ID and fit as the standard ones for the 450 series but are much stronger with more plastic material on them. Furthermore, the rod screws much deeper into the plastic and it will require way more force to be pulled off across the thread. This mod is not a must if you are not a 3D pilot but at least should put some peace in your mind by taking care of a known weak point in the DFC setup.